I thought I took a lot of pictures at Quilt Market, but this is a booth where I really wish I had taken more pictures. Anthology Fabrics has lots of gorgeous batiks. I found myself drawn to the vibrant colors in some of the quilts they displayed. This quilt is called Rock Candy and was designed by Madison Cottage Design. It is 60×72″ and was pieced by Karen Ytzen and quilted by Sue Pawlowski. This one is Brilliant Beauties of Joy and it was designed and pieced by Jacqueline De Jonge of Be Colourful. It was quilted by Elly Prins. It measures 80×80″. Designed and pieced by Cat Nix of Catnix Designs, this quilt is called Calypso. It was quilted by Shawn Leighton of C&L Quilting. Unfortunately, in every picture I took I managed to chop off some part of it, so just imagine the top looks like the bottom. When it is all there, it measures 70×70″. Also designed and pieced by Cat Nix, with quilting by Shawn Leighton, this last one measures 37×60″ and is called Baubles N’ Beads. Sorry about the weird angle on this one. Sometimes things were difficult to get straight on. Still pretty, right? There were many other gorgeous quilts in this booth, and I really loved their fabrics. I have tried to link up to those who worked on each project, so you can check them out if you want to see more of their work. 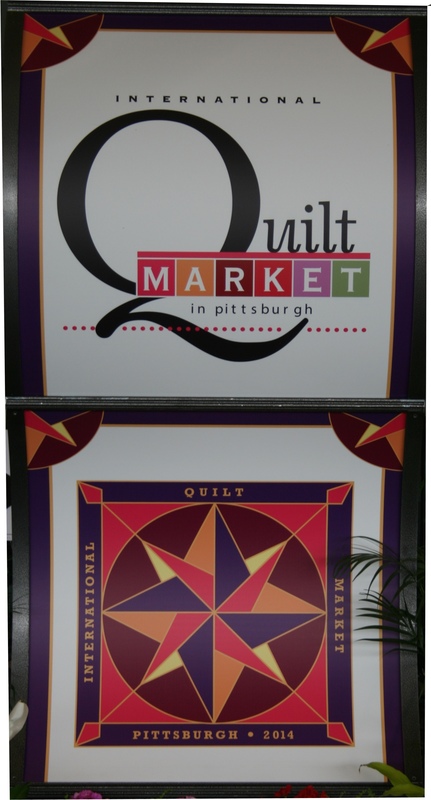 Cotton+Steel gave the opening presentation in a special session at Quilt Market on Thursday. Thursday night was Sample Spree at Quilt Market. Many of the Market exhibitors sell their wares at Sample Spree. This was the Cotton+Steel booth at Sample Spree. They sold all the fabrics they brought to Sample Spree in about ten minutes. It was crazy. Cotton+Steel is the result of the collaboration of designers Melody Miller, Alexia Abegg, Rashida Coleman-Hale, Kim Kight, and Sarah Watts with the team at RJR Fabrics to develop a new division. Many of the clothing patterns were from Green Bee Designs. Want to learn more about Cotton + Steel? Check out this video. Is there such a thing as fabric brain overload? I think I might have hit it. 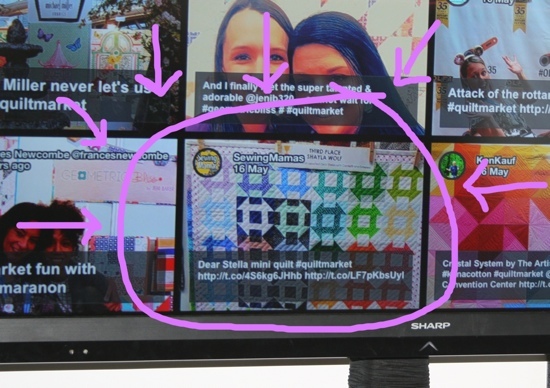 Riley Blake sponsored a display wall showing tweets and IG posts with the #quiltmarket tag – I even have a photo of that with a Sewing Mamas IG post on it! So, ummm, yeah. I have a lot of photos to sort through. How many do you want to see??? Whew! Windham Fabrics Ciao Bella Mini Quilt! By now the folks at Windham Fabrics may be wondering why they thought it was a good idea to let me make a mini quilt. I am trying to remind myself that I am my own worst critic. Yikes. This was one of those situations where I really wanted everything to be just so and work out just perfectly. Of course, this meant that would definitely not happen. After I decided what to do with the fabrics, I started to freak myself out by all the ways I could mess up the fabrics. What if I cut them wrong? What if I have underestimated the seam allowances in my calculations? What if I don’t have enough fabric for the back? What am I going to use for the binding? What if, what if… argh!!! Just cut it already!! As it turns out, the words on green were just the right size to use as the backing for the quilt. I decided to use that instead of the brown floral that was sent but was not part of the Ciao Bella collection. The finished quilt is 18″x18″. The two smaller pictures of the girl are framed to look like the little tabs over the corners of photos in a scrapbook, so they are only sewn in the seam at the corners and then the diagonal is open. Hopefully they look like snapshots? And oh, the binding was such a nightmare. First I thought it would be neat to make it so the buildings were running across the top and bottom horizontally and then cut the side pieces vertically so they would be upright. I found a tutorial to bind each side into a mitered corner and it seemed simple enough. The side pieces just ended up looking kind of weird because the binding on a little quilt is, well, so little! And I just could not get the corners to work out nicely so after several attempts I gave up on that idea. (But part of me still thinks it would look so neat!) I should have just put a regular binding on, but I still had this other idea with faux piping that Kelly O. stuck in my head. Making the faux piping binding was simple enough. If you check the link above, the video tutorial is very easy to understand. Putting it on there and lining it all up was just errgh. I tried putting wonder clips on it. I pinned it with pins parallel to the binding. I pinned it with pins perpendicular to the binding. I seam ripped. Oh, did I seam rip. I am fairly certain that in the end, I could have just hand sewn a regular binding on it in half the time I spent sewing and un-sewing that monster. Here’s the whole thing, quilted and bound. It is probably good that there was a deadline on this, otherwise it would have taken up residence in my UFO pile a week ago. Even after I had finished it, I was still second guessing some of my choices. But, in the end, it is okay. Hopefully it made its way safely through the postal system and I will see it again in a couple weeks at Quilt Market! I am excited to see what all the others look like.